Interior Ministry: 20 ‘Terrorists’ Were Neutralized, 757 ‘Terrorist Suspects’ Were Detained In Turkey On October 22-29 5 out of 5 based on 3 ratings. 3 user reviews. The Turkish Interior Ministry released a statement providing details on security developments in the country in the period from October 22 to October 29. According to the released statement, 20 “terrorists” were neutralized across Turkey and 757 “terror suspects” were detained during the aforementioned period. 186 persons alelgedly linked to PKK/KCK, 478 – to the Fethullah Gülen movement (known in Turkey as Fetullah Terrorist Organization), 67 – to ISIS and 26 – to far-left groups. The Interior Ministry added that security troops had seized heavy weapons (two M-16, three rocket launchers, 11 rifles), 25 hand grenades, 54 kilograms of explosive material and 783 ammunitions. 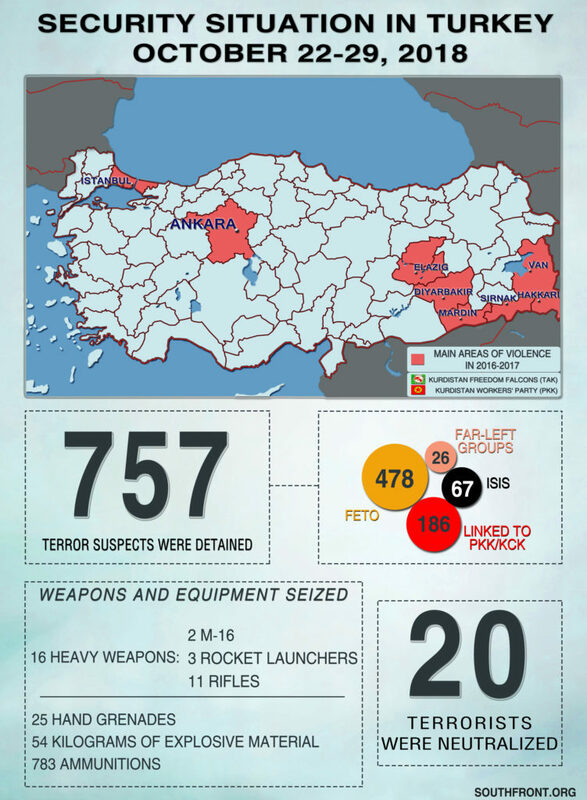 It’s interesting to note that Turkish authorities release such reports on a constant basis providing significant numbers of detained and neutralzied terrorist suspects. These statements demonstrate that the security situation in the country is complciated despite the government attempts to demonstrate the internal stability. Meanwhile, the Turkish Armed Forces (TAF) resumed its military activity against Kurdish armed groups in northern Syria. On October 29, tthe TAF carried out a series of airstrikes on targets nera Kobani. The Kurdish People’s Protection Units (YPG) already threatened to carry out attacks on the TAF in response. Adolf defined a terrorist as anyone that was not a member or supporter of the Nazi Party. Fuhrer Err Dawg defines “terrorist” as anyone not a member or supporter of AKP, Anatolian Knazi Party. a fly by night country who have create isis along with her masters and been receiving the stolen oil from Syria now they arrest their own minions ? Bullshits. If me don’t like you, you be terrorist! Me eliminate or detain, harrr, harrr. It really is past time to partition Turkey and establish permanent Kurdish homeland on their historic soil in the eastern half of Turkey. After all they did clear the Armenians out of there in 1915 and its been their homeland ever since. Time to stop bluffing sultan nErdy.